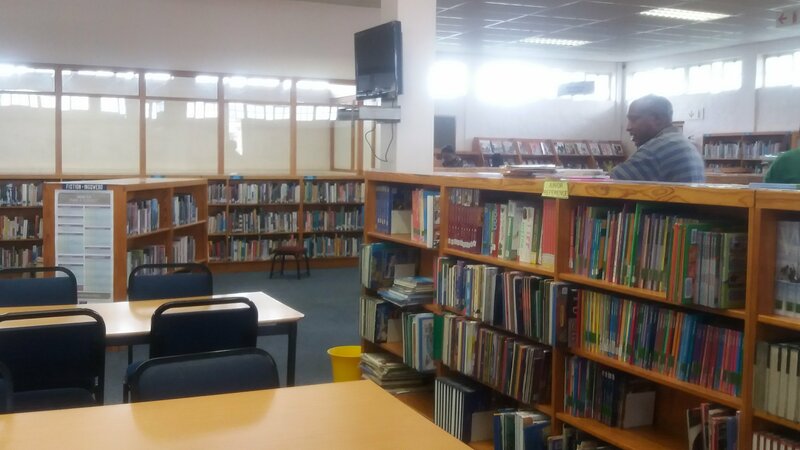 We have been in South Africa all of 2 weeks now, so it’s time to blog about it. But where to start? And how on earth to make sense of it? We have only covered a small part of a large and varied country, and one which has undergone so much change in the space of my lifetime. As a child, I remember my family boycotting South African fruit, John actually came to visit relatives here in the 70s, when apartheid was in full swing, and I vividly remember, when my kids were little, the release of Mandela and the first free elections, a huge deal in the news then. The whole political upheaval of South Africa has always seemed very much in our consciousness in the UK. More recently, I have heard those who fought against apartheid, and people who love the country, in despair about how the South African government is going, about how all that Mandela achieved is being betrayed and hopes dashed. One issue that is a real problem is poverty and inequality. The unemployment rate is 27%, much higher for young people. 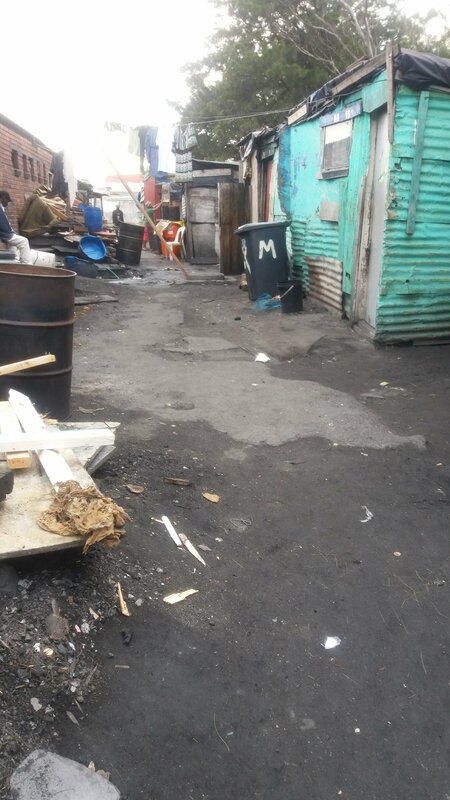 In Cape Town (which people say is not typical of South African cities – in that you can walk around relatively safely as long as you use common sense, whereas places like Johannesburg you just wouldn’t), you still see large numbers of homeless people, beggars, and shacks piled up along the highways where people do apparently live. And you can tell by the housing in some areas, that there are some well off people eating out in expensive restaurants, shopping till they drop, and driving pretty flash cars. One photo I didn’t take (it would have been wrong to raise my camera) was this scene: at a red traffic light, we were behind a Deliveroo style motorbike, whose sign read “Hungry? Call 0219999497 for delivery”. Next to him, by complete chance, stood a forlorn homeless guy (incidentally white) with a sign on brown card reading “Hungry, please help me”. 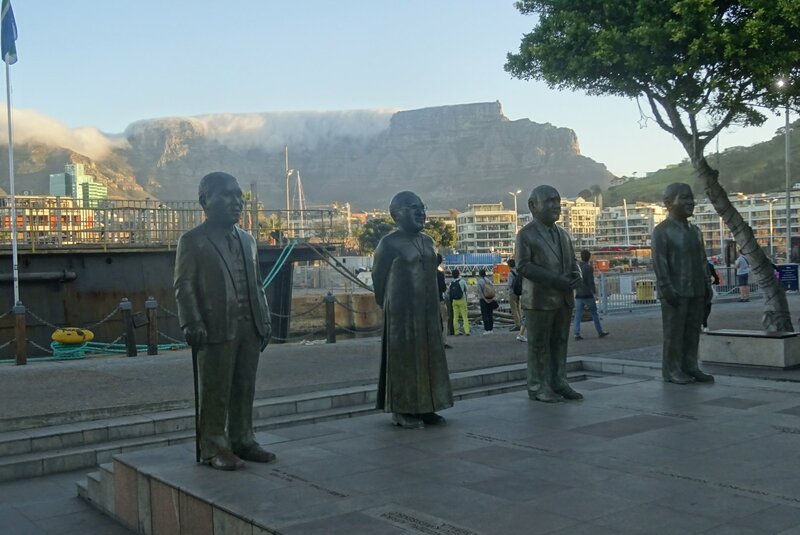 The free historical tour of Cape Town. One of the major things I learned from this was that Cape Town was built by slaves, who were imported in huge numbers by the Dutch East India Company (or VOC) from the 17th century onwards. At one point, there were 4 slaves for every 1 free person. The excellent Slave Lodge Museum tells their story well. These people came from places like Indonesia, Madagascar, Mozambique, Malaysia, in fact wherever the Dutch Empire was. 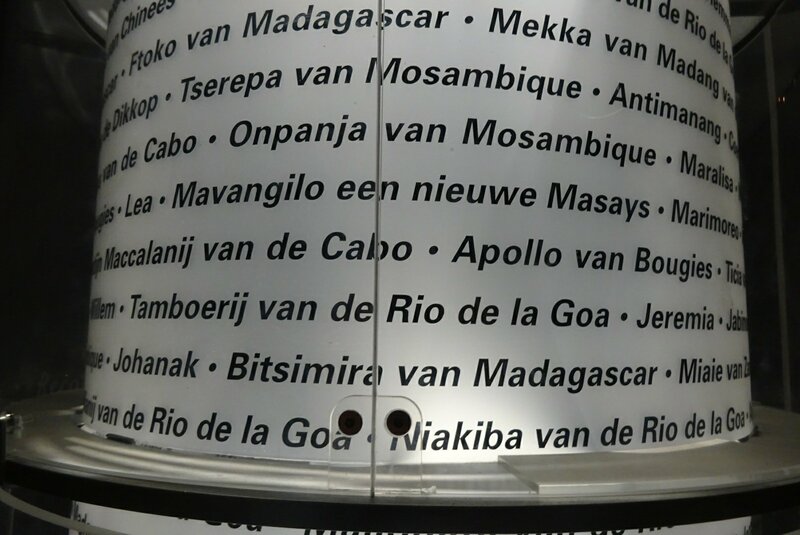 The slaves’ names are recorded on pillars in a square in Cape Town, and they have names like Bareka van Zanzibar or Tamboerij van de Rio de la Goa , based on where they were shipped from, or Moses January, based on the month they arrived – their real names lost forever. The British, needless to say, got involved in the 19th century, after slavery was in theory abolished, by providing so called “prize slaves” who had been picked up elsewhere. The Rooibos tour. This was in Clanwilliam, where we stayed before Cape Town. I have drunk a fair mount of Rooibos but never knew much about where it came from. I now do, thanks to Chris and Annette who showed us the Rooibos bushes growing (no relation to tea plants, more like a broom shrub, if you know your plants), as well as the processing plant, and then let us taste various types of Rooibos. The plants will only grow in that part of South Africa, the Western Cape, in a pretty small area. Chris told us with quiet glee that people have tried, and absolutely failed, to grow it in China and the US. The problem now is the drought, in its 3rd year now, so we saw rows of plants which include a fair number of stunted and dead bushes. Rooibos is increasing in popularity, research keeps finding more health benefits, but that increased demand is of no use to the farmers if lack of water is killing their crops. They are worried about their livelihood. 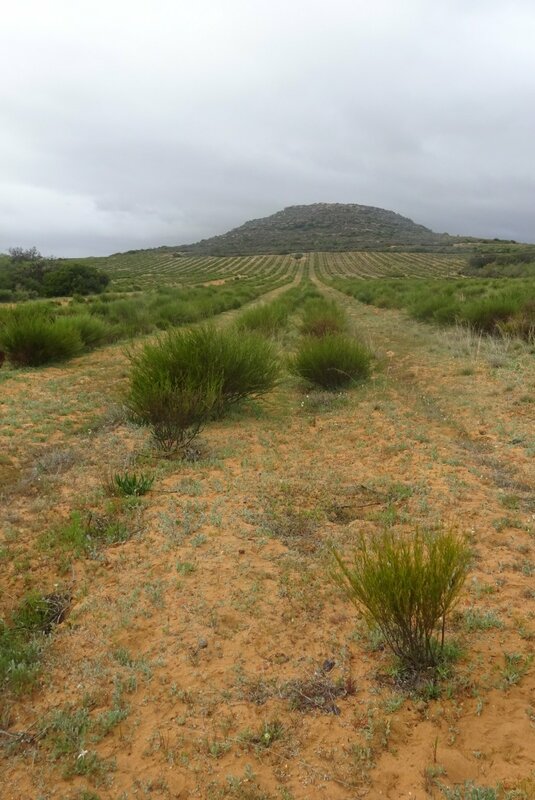 Rooibos plants – not tea at all! 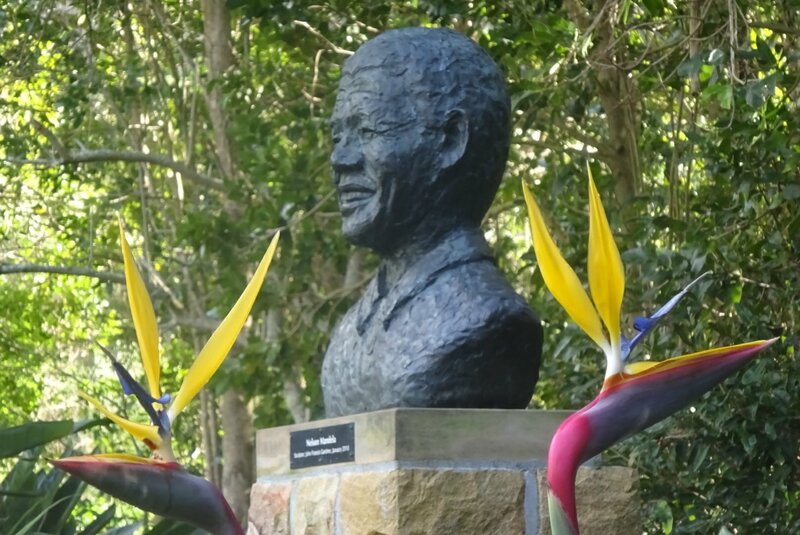 Kirstenbosch Botanical Gardens tour. This one appealed to the nerdy gardener/plant fancier in me! 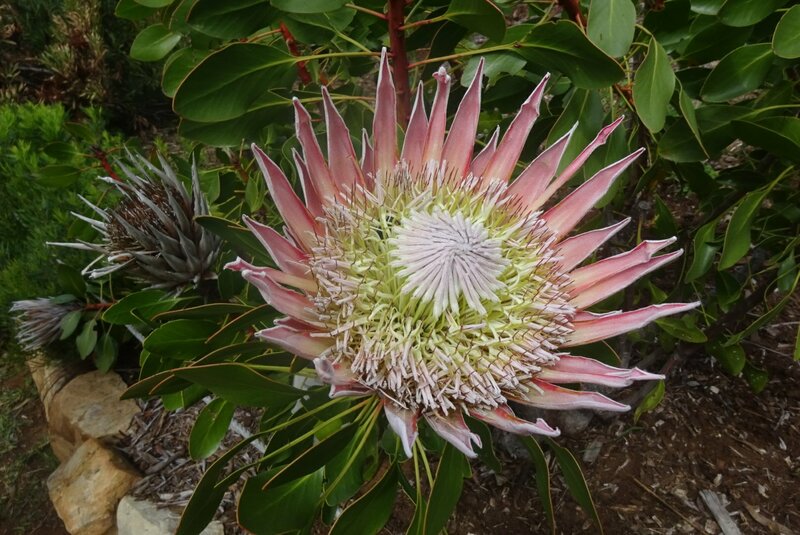 I can recite the 4 elements that make up fynbos (the ecosystem of plants unique to the Cape area) – proteas, ericas, restios (a kind of reed) and bulb plants! We learnt about a tree that, when giraffes start to eat it, not only changes the taste of its leaves to become bitter, but tells neighbouring trees to do the same – something to do with pheromones I think! We also saw some of the spring flowers which we’d not seen in the drought struck Western Cape. Seriously, if you’re in Cape Town, go to Kirstenbosch even if you’re not a nerdy gardener, it is a beautiful garden on the slopes of Table Mountain, with places to walk, sit and appreciate the peace and quiet. 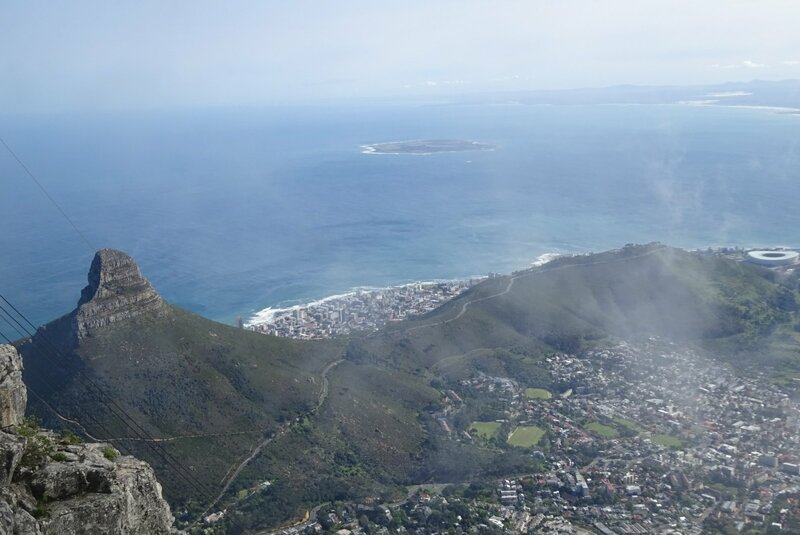 The Table Mountain Walk. Pietro, a South African of Italian extraction, who could talk the hind legs off a donkey, led us up Table Mountain, in a howling gale – we learnt an awful lot about South Africa, and were well entertained. The high winds meant the cable car was closed, so we had to walk down as well, which meant sore leg muscles for the next few days! The views, when the clouds cleared, were amazing.